Breaking out the BBQ smoker for a chicken thigh cook-off? In today's guide I'm going to show you how to smoke chicken thighs in just 10 easy steps. Chicken thighs are really underrated. Not only are they much cheaper than wings or legs, but they’re also a much darker meat, making them packed full of flavor. That’s not all. They tend to cook much faster than other parts of the bird while still providing a fairly generous amount of meat (especially when compared to parts like chicken wings). So it’s little wonder why they prove popular. Their fat content makes them delicious smoked, and they take next to no time at all to cook when compared to other types of meat. A general rule for all types of cooking is that you get what you pay for, and this is especially true with meat. Thankfully, chicken thighs tend to be at the lower end of the price spectrum without necessarily compromising on quality. Do your research though and try to get the best quality you can, without breaking the bank. Try to make sure that the thighs are fairly consistent in size. This is because we want our thighs to all take about the same amount of time, and we want to reliably estimate when they’ll be done by. Inconsistent sizes will lead to messy cooking times as you’ll have to be constantly checking on the progress of each individual thigh. Also try to get some spare. The fact that they’re quite cheap means that we have the luxury of chucking a couple should they turn out dud. Brining is an often forgotten step but it’s super important to help retain moisture in meat. This is especially important with smoking because it can leave meat exposed to warm temperatures for hours at a time, making it prone to drying out. Brining helps the meat retain as much of its moisture as possible. Fill up a tub with a gallon of water. Add one cup of coarse salt to the water and sit the salt in until dissolved. Add your chicken thighs to the salt water, submerging all of them. Put the tub in your fridge and leave for one hour. Once the hour is up, remove the tub from the fridge. Remove the chicken thighs one by one, and place them on a clean towel or paper towel to dry. If you need a brining method, then check out my chicken wing brine recipe. 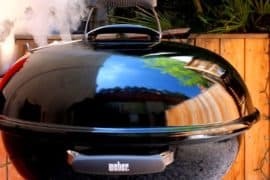 Smokers can take a while to heat up, particularly if they’re charcoal, so while your meat is brining it’s a good idea to take the opportunity to preheat your smoker. Our ideal temperature for chicken thighs if 225 degrees Fahrenheit. To impart some added flavor onto our chicken thighs we’re going to make use of a rub. The best way to do this is to use a baking tray. Place the tray on your counter and then place your chicken thighs one by one onto the tray, leaving a little bit of space between each one. Use a second tray if you run out of space. 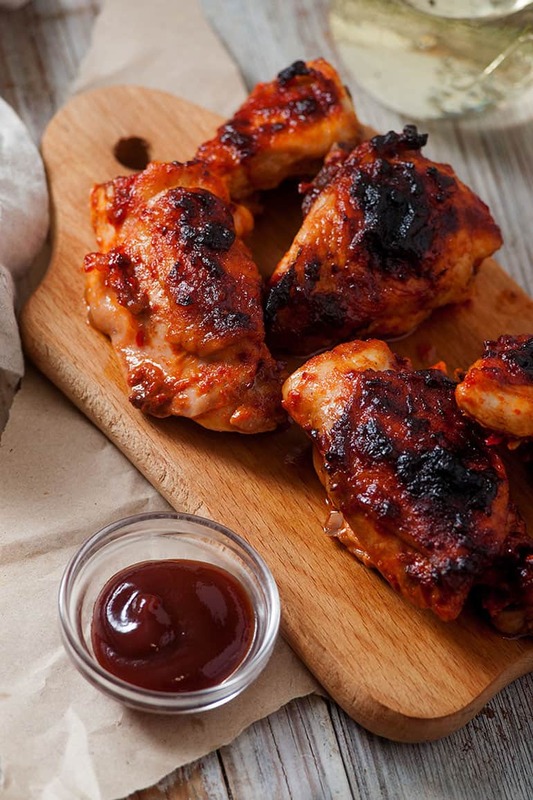 If you have a pre-packaged or pre-bought rub then shake it generously over the thighs. If you have made your own, then combine all the ingredients for it in a medium size bowel. Then shake over the meat. Use your hands to rub in the meat rub. If you want to prevent the rub getting stuck to your fingers then you can use rubber gloves to help make the process a bit cleaner. It’s also more hygienic, which can’t be a bad thing! Be sure to rub the meat on both sides, covering the entire cut. Also rub under the skin as best as possible. Hopefully by now your smoker has reached 225°F, in which case we are ready to smoke! We’ll be cooking for 2 hours at 225°F, or until the internal temperature of the thighs hits 160°F. Carefully place each thigh on your smoker’s tray and close the door. 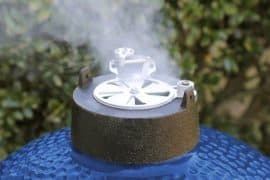 If your smoker needs the use of a water tray then make sure that you have filled that. 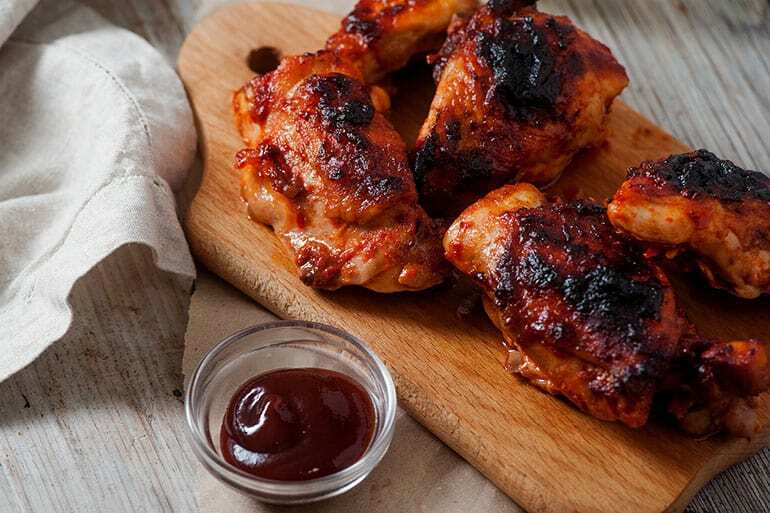 Now that we have two hours to play with, let’s prepare something delicious to accompany our thighs: A kicking BBQ sauce. In a medium saucepan over a medium heat, add the entire bottle of your chosen BBQ sauce. If the sauce is quite thick then add your choice of either beer or cola to thing it out a little. Personally, I use cola because i like the sweetness it adds, but I’ve had it with beer too and it works great. Whichever you choose, add about one cup’s worth and stir it in over the heat. Heat until the sauce is to your temperature preference (don’t let it boil!). Once the two hours is up, or your chicken’s internal temperature has reached 160F, remove the thighs from the smoker. Place them on a plate or tray on a counter, next to your sauce. One by one, use tongs to dunk and smother your thighs in the sauce. Be sure to cover as much as you can of the thigh. Once you have covered all of the thighs, put them back in the smoker for an additional 10-15 minutes. After 10-15 minutes, remove the thighs from the smoker and let cool for 5-10 minutes. 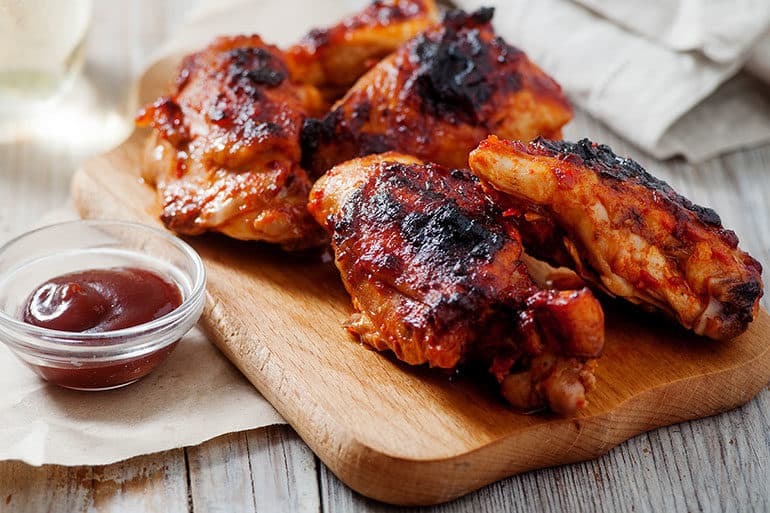 This simple rub recipe boasts a beautiful blend of paprika and chili powder to give your chicken thighs a kick when fresh out the smoker. One of the most important - if not the most important - parts of the BBQ setup is choosing the right smoking wood. 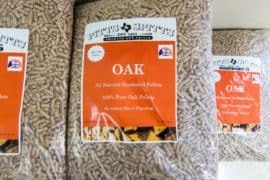 Personally I like to use applewood for chicken thighs. It generally goes well with all cuts of chicken, but I think it matches the fat content thighs perfectly. Skin can be difficult when it comes to smoked chicken. You simply won’t achieve the crispy layer that you often get with grilled chicken because our smoking temperature is too low So what should you be aiming for? 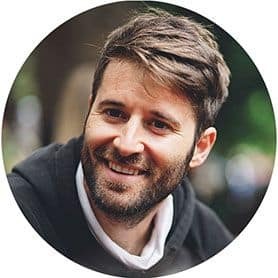 What you need to try to achieve is a soft layer that you can easily bite through. We can combat this by scraping away the fat found underneath the skin. This can be done by pulling back the skin and removing the fat from the underside of the skin until it turns translucent. Put the skin back. Do this before applying your rub.